Not as far away as you think. Returning riders can start to register February 9th, 2019. New riders can start to register August 9th, 2019. Please read the Waiver and the Terms and Conditions carefully before submitting your Application package. Several passages in the 2020 Terms and Conditions are new; be sure to read it all. Complete the application and a brief bio about yourself, your bike or your reasons for riding. You will be contacted by the Hoka Hey Motorcycle Challenge™ Organizers once your application has been processed. Please allow 1 to 2 weeks for processing. 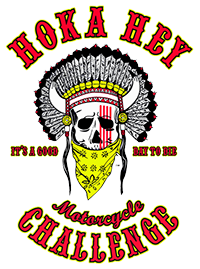 The 2020 Hoka Hey Motorcycle Challenge™ will depart Panama City Beach, Florida on August 9th, 2020. Each rider will set his or her own schedule, while driving within the posted speed limits on all roads traveled. This year's event will be open to riders of all American Manufacturers V-twin motorcycles. - Motorcycles will be limited to a 6.2 gallon fuel tank. Fuel cells, auxiliary tanks and additional gas cans will NOT be permitted. - The use of electronics to navigate and mounting hardware on handlebars will be discouraged. - All bikes will be required to have a working odometer. - The Organizers reserve the right to restrict other modifications at their own discretion if the modifications affect the safety of the rider or others who travel the roads. Participants must be 18 years of age by the start of the challenge in order to participate. Participants will be notified of registration and check-in agendas as the time approaches. Riders should allow for the possibility that they will have to be at the starting line two days before the start of the challenge. All participants will be required to register and present their motorcycles for inspection. All motorcycles will be subject to the restrictions and requirements outlined in the Terms and Conditions. The entry fee is $500.00 U.S. (Five Hundred Dollars U.S.) and must be paid in full prior to 9 May 2020. A deposit of $250.00 is required to hold your place in the 2020 Challenge. Participants are required to cover the expense of your tracking device which shall be provided by US Fleet Tracking. You will need to provide your Hoka Hey Motorcycle Challenge rider number when purchasing your GPS Tracker to get the group rate. Riders are responsible to pay for the tracking devices and its installation as well as any other fees which may arise during the event (i.e, food, fuel, accommodations, maintenance and supplies, etc.). The Organizer reserves the right to refuse your entry or participation prior to and during the Event at any time and for any reason whatsoever (without being obliged to disclose the reason). If your application is accepted and your activities result in the later removal from the event, no refund of any sort will be made. Participants may seek their own approved sponsors for this event (see Getting Sponsors). The terms of such a sponsorship must be negotiated solely for the benefit of the participant and shall be the responsibility of the participant to fulfill. Such negotiations shall not obligate or encumber the Hoka Hey Motorcycle Challenge™ Organizers in any manner whatsoever. Veterans may take advantage of our Sponsor a Veteran Program which gives a business or individual the opportunity to pay a Veteran's travel expenses in return for displaying their logo on the Vet's bike. Please see the Sponsor a Veteran page for more information. Download the Release and Waiver and Application or click APPLY NOW to apply online. You can use the online form below to submit your application.